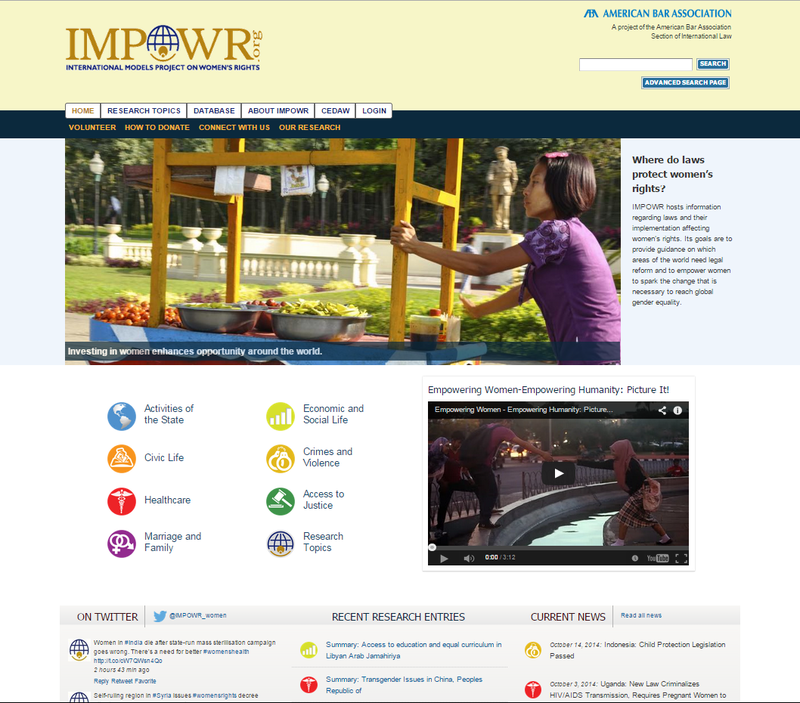 The IMPOWR Project, a recent initiative of the American Bar Association, is an effort to highlight gender equality and woman's rights under the law worldwide. It was originally assumed that the website would be used in internet cafés, and therefore we initially focused on building the database structures with a low-bandwidth interface. The data model was presented as a sophisticated matrix of laws and practices organized by country, topic and categories. Three years into the project the audience for the website is more apparent and the bandwidth restrictions have been lifted. The website has gotten a complete facelift to improve the graphical interface and take advantage of a larger role for social media and multimedia capabilities. In phase one, we concentrated on building the data model to ensure that it aligned with the research. Each country can have postings in 36 different subtopic areas, and within those, in five different categories of law. This logic is managed by extensive use of taxonomies, and the results are displayed through complex screen views. Drupal made it possible for us to express this complexity through a simple interface for researchers around the world to enter their content without any formal training, and for the audience to easily find the available research. IMPOWR's focus was to find research to populate the database. Phase two granted us the freedom to enhance the content and appearance of the website beyond the research database so that we could further build the audience. Following additional extensive strategy discussions, we advised on increasing the role of social media, particularly Twitter, to increase awareness for IMPOWR. We expanded the types of content available on the website to create a more complete experience, including news, video and resources. We also upgraded the website to Drupal 7 using a mobile-first approach.